Welcome to the 7th year of Diabetes Blog Week. This is my 3rd time participating and I swore I wasn’t going to do it again this year. Why? Because I get totally burned out by writing blogposts every day and trying to read the posts of 100+ participants. Somehow I am incapable of staying low-key during the week and always overdo it. So why am I here? Because Diabetes Blog Week links me to voices of diabetes from all over the world. At the end of the week I will feel exhilarated after meeting new bloggers and catching up with those whom I already “know”. I’ll learn more about myself and my diabetes as I tackle the topic list. On Friday I will be proud that once again I have survived Diabetes Blog Week! As always, thanks to Karen Graffeo of Bitter-Sweet™ for organizing everything. Today’s Topic: Lets kick off the week by talking about why we are here, in the diabetes blog space. What is the most important diabetes awareness message to you? Why is that message important for you, and what are you trying to accomplish by sharing it on your blog? That is typical blah for mission statements and I could easily write the same words again today. The main change is that it’s now been almost 40 years of diabetes. I wrote one sentence in my first blogpost that seemed innocent at the time. It has morphed into one of the main reasons I continue to blog. Talk about the understatement of the year. I predicted that the Affordable Care Act (ACA) would bring me lower premiums and worse coverage. Wrong! I still have good coverage for diabetes expenses, but my premiums have almost doubled and they were expensive to begin with. Many DOC friends have fared far worse with huge increases in premiums and deductibles along with difficulty obtaining needed supplies and medications. Insulin prices have soared and for each insurance company mandating Humalog, there is another one requiring Novolog. The recent UnitedHealthCare mandate for Medtronic pumps is symptomatic of a broken healthcare system that increasingly devalues patients and results in huge profits for insurance companies, pharmaceutical/durable medical companies, and middleman wholesalers. I am now counting down the months until Medicare. I am proud of my gray hair and feel strongly that I would like Test Guess and Go to become an information and advocacy resource for seniors with Type 1 diabetes. CGM coverage is one of the most visible battles but it may be just the tip of the iceberg with programs like Competitive Bidding threatening choice and access to needed supplies. In three years of blogging I have been learning how to advocate. I know that I am a better writer than speaker. I know that I prefer one-on-ones to larger advocacy forums, but I am trying to grow. Regardless of where my senior years take me, Type 1 diabetes will be there and there is no reason to fight that. I don’t know how long I will continue to blog, but I’m not ready to quit yet. To read other Diabetes Blog Week posts on this topic, click here. Last week I had the opportunity to attend the 2016 Medtronic Diabetes Advocate Forum in Northridge, CA. This was the first time I have been invited to such an event and I found it to be a great experience. The advocacy power in the room was palpable with representatives from 5 Latin America countries, 2 from Canada, and 14 from all over the US. I was proud to be the one with gray hair in the group photos. My social media skills were not quite as adept as those of the younger attendees, but I represent a growing population: seniors living with diabetes. I felt welcomed and respected by all. This idealistic philosophy envisions a table where all of the players meet with the patient as the focus. Doctors, pharma/tech companies, government, payers, and patients work together to achieve better clinical outcomes and high levels of satisfaction for patients. This is easy to draw on a white board, but unfortunately not the reality for most people affected by diabetes. What is the role of Diabetes Advocates in this vision? I like to think that we are working to bridge the gap between how things are and how things should be. We are fighting to identify and throw the “Lack of” monsters under the bridge: lack of availability, lack of access, lack of coverage, lack of education, and lack of respect. There is a huge gap in diabetes care between the “haves” and the “have-nots.” This disparity is significant in the United States and becomes even more staggering in a global view. In the conference room of advocates we had the mother of a child who was part of an artificial pancreas trial. In contrast we had representatives from countries with little or no access to diabetes education and advanced technology. Missing from the room were people from all over the world with marginal access to insulin and diabetes supplies. The future success of a company like Medtronic is tied to providing products and services that deliver value-based quality healthcare. Positive clinical outcomes and patient satisfaction are worthy goals. Those are big words to describe what we all want: a happy and successful life with and despite of diabetes. We advocates have a symbiotic relationship with companies like Medtronic. They need us as the faces and voices of people with diabetes. We need them for products, services, and the ability to open doors to decision-makers. I believe that their success results in better health for those of us with diabetes. Similarly, better outcomes for me should ultimately result in a healthier bottom line for them. Sitting at the table together gives both of us a better chance for success. Transforming diabetes care together, for greater freedom and better health. Disclosure: Medtronic Diabetes paid for my travel and hotel expenses to attend the forum. As always, my thoughts and opinions are my own. This got me thinking about now that I have blogged for over a year, why do I blog? Have I achieved any of the aims that I professed in my first post? What have I gained from it? Have I added anything to the Diabetes Online Community (DOC)? Am I enjoying myself and what do I think about the future of Test Guess and Go? Why do I blog? The main reason I blog is that I enjoy writing and creating graphics, some silly and others more serious. It’s something to do. I’m at a stage in life where I no longer work and am not satisfied with having something like golf be the center of my life. I am certainly not an artist or a great writer, but I like having a creative outlet in my life. Sometimes I think that it is pitiful that I spend so much time writing about diabetes, but there is no doubt that it is something I know a lot about and spend a lot of time dealing with. Is it to become rich? That’s a joke, although there are a handful of diabetes bloggers who have used their blogs as stepping stones into careers as diabetes advocates and social media consultants. Although their lives are purposeful and rewarding, I don’t think that anyone has yet financed a mansion on Diabetes Easy Street through books and consulting fees. I’m not being paid to blog and except for an occasional book or CGM case, I have received no concrete rewards. I have not been approached with bribes of cash or chocolate-covered donuts to sway my opinions on any issue. Is it to become famous? 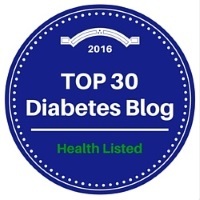 I admit that one of my aims in starting a blog was to increase my presence in the Diabetes Online Community (DOC). I hoped to become a little fish in what is a big pond for those of us with diabetes and a little pond when it comes to the whole wide world. The measure of my new-found fame is that now when I Google myself, I find images and links. Previously I did not. To put this search engine fame into perspective, my dog shows up in “Abby the Black Lab” Google searches and prominently sports her flowered hat and DSMA crown in the image section. Is it for diabetes advocacy? Advocacy is a hot topic in the DOC and it easily becomes a burdensome topic. One of my favorite discussions of this burden is a January 2014 blogpost by Scott from Rolling in the D. If I summarize his thoughts correctly, he was writing (and maybe whining) about the expectation that just because he was a diabetes blogger that he was required to become an Advocate with a capital-A. At the same time he understands that through his sharing his diabetes story, he has probably turned into an advocate. That’s true for me also. I refuse to feel guilty that my main goal in blogging is not and never has been to be an advocate. I am a good follower/supporter and feel proud of my participation in DOC projects such as Spare a Rose. I have also initiated some projects such as my Type 1/Type Conversations with Kate Cornell of Sweet Success: My Life with Type 2 Diabetes. But I don’t want to be weighed down by expectations of what I should be doing just because I write a blog. Nor do I want to feel bad if I feel that I’m not living up to what others in the DOC are doing. Do I pay attention to stats? You betcha. Do they make sense? Sometimes, but not always. Some posts that I work really hard on get fewer views than others which are flippantly churned out when I just want something to publish. Stats provide encouragement because they show that I have gained new readers in the last year. It’s hard work to write a blog and readership is a compliment. One of my biggest achievements is that I have finally written some posts with more views than those of Abby the Black Lab. Where do I fit into the DOC? I am one of hundreds of bloggers in the DOC. I am old enough to be the mother of most Type 1 bloggers and I am happy that you have accepted me as a friend. I believe that my co-bloggers and I are good writers and I am proud of what has been published on Test Guess and Go. Some of our posts have been highly praised and commented on. At the same time I am careful not to become jealous of more-established bloggers who get tons of views and repeatedly get invited to represent us at conferences. One reason is that they have earned their place and secondly, I don’t want the responsibility that goes along with being “big-time”. I will continue to be a happy little fish and work hard to support all of the other fish, big and small, in the DOC. Am I fulfilling any of my goals? Yes, I think that Test Guess and Go has become known as a blog where people of about my age have a place to talk about how diabetes has affected our lives. Sue from New York has described both her experiences as a Type 1 approaching Medicare age and her life as a parent of a Type 1. Sue from Pennsylvania has written extensively about her Type 1 husband and advocated for Medicare to begin providing coverage for CGMS. I’ve shared stories of diabetes then and now and have not been shy about expressing my opinions on any issue. What has been the main benefit of being a blogger? With no doubt, the answer is friendship and relationships. My blog contributors, Sue from NY and Sue from PA have become good friends who understand and walk-the-walk of Type 1 diabetes. Building on my Twitter and Facebook relationships, I’ve continued to meet and get to know many people living with all types of diabetes in the USA and around the world. No one wants diabetes in their life, but the people I’ve met in the DOC are incredible! What is the future of Test Guess and Go? It is here today and will be here tomorrow. Beyond that the future is an unknown. I would like to hear from more seniors who are approaching Medicare age or are already there. If you are interested in writing a guest-post or becoming a regular contributor, please contact me. I hope that our readership will continue to grow. I hope that I can continue to find things to write about. I hope that my Windows desktop computer continues to work so that I still have access to my beloved Adobe CS5 design programs. As always, I hope that diabetes will be cured and that the theme of this blog can be changed to Golf, Hiking, and Dog-walking for Old Ladies. I first “met” Kate Cornell in early 2013 when I began listening to the podcast archives of DSMA Live. Her February 2012 interview introduced me to a woman who knew an incredible amount about diabetes and was well-spoken and passionate. As I began to follow her blog, SWEET SUCCESS: MY LIFE WITH TYPE 2 DIABETES, and read her comments around the diabetes online community (DOC), I found myself thinking that her opinions mirrored many of my own thoughts about diabetes and life in general. The fact that I have Type 1 diabetes and Kate has Type 2 diabetes just didn’t seem to make any difference. Kate and I recently came up with the idea of collaborating on a series of four blogposts in which we will initiate a dialogue on issues that affect people in the diabetes community. We expect to learn a lot from each other and we hope that our Type 1/Type 2 Conversations will lead to more communication and mutual respect between people with all types of diabetes. Laddie: For the first Type 1/Type 2 conversation, I figured that I wouldn’t shy away from a difficult topic: Weight. Weight is the elephant in the room in most discussions and arguments between people with Type 1 diabetes and those with Type 2. Weight is synonymous with blame, guilt, and ignorance. Many people with Type 1 diabetes are thin and some of us were almost skeletal when we received our diabetes diagnosis. When you have Type 1, it is easy to associate being thin with “Not My Fault.” If you become comfortable in this thought process, the next logical step is to become comfortable with the stereotype of Overweight = Type 2 = Their Fault. A long time ago I learned to stay out of the Type 1/Type 2 wars and keep my mouth shut. That doesn’t mean that I didn’t believe a lot of the stereotypes. I’m not going to be virtuous now and say that I have totally seen the light. No, I’m going to say that I just don’t know. In recent years I have read a lot of research that indicates that Type 1 and Type 2 are just different manifestations of inflammation and autoimmunity gone astray. Maybe just a flip of the coin made me Type 1 instead of Type 2. I have a friend who was diagnosed with Type 2 several years ago. She has always struggled with her weight. She and her husband go on the same diet. He loses twenty pounds and she loses one. She wonders whether the abnormalities of metabolic syndrome and Type 2 diabetes are responsible for her weight problems, not the result of her weight problems. She might be right. I am very thankful that except for an occasional extra five or ten pounds, I have never struggled with being overweight. In my many years participating in the DOC, I have learned to be less judgmental and I have gained more understanding of the issues that those with the “other kind” of diabetes face. In the last two years I have gained 5 pounds that I have been trying to lose. I’ve had no success. Do I think that it would be easy to lose 50 pounds or 100 pounds. No way. I can’t even lose 5 pounds. Many people with Type 2 diabetes struggle with weight. Many people without diabetes struggle with weight. Many people with Type 1 diabetes struggle with weight. When I read the definition of weight in my dictionary app, I only see that weight can be measured in things like mass, thickness, gravity, and load. I don’t see judgment. I don’t see criticism. I don’t see blame. We can learn something from that. Kate: The subject of weight and diabetes is certainly a good place to start our conversations. Laddie hasn’t shied away from what is usually a very controversial subject. Our society is obsessed with weight: how to lose it, how to remain pencil thin and blaming those who carry too much. I have struggled with excess weight for most of my adult life. I was a thin child and teenager. I married at 20 and once I began having children, the weight just crept up. I always thought it was because of the pregnancies and my inability to take off the “baby weight”. Whatever the reason, it was difficult to lose. Fast forward to my diagnosis of type 2 diabetes at age 50 and cue the guilt. It doesn’t matter that I’ve spouted, quite often, about how our type 2 dxs aren’t our fault; the guilt is still there. “If I had just lost weight earlier.” “If I’d just worked a little harder.” It’s easy to blame ourselves. Here’s the thing: diabetes, regardless of type, is NOT the patient’s fault! Yes, those of us with type 2 are often overweight or obese, but so are millions of other people and they don’t have diabetes. Sometimes it’s hard to remember that when the media is waving the fat shaming in our face. I was diagnosed nine years ago this summer. I have educated myself and made some significant changes to my diet and lifestyle. (That doesn’t mean I’m always perfect. Far from it.) I did manage to lose some weight early on, but things have changed in the last year. Even though I now eat very few processed carbs and more veggies; even though I exercise for 30 minutes nearly every day, I am gaining weight. It could be due to a myriad of hormone issues: thyroid, female, insulin…but in the end it doesn’t matter what the reason is for my inability to take the weight off. I’m trying as hard as I can and it won’t budge. Is that my fault? I don’t think so. Many people with type 1 are weary of being told that “if you lost a bit of weight you could probably get rid of your diabetes.” Guess what, so are those of us with type 2. The myths that revolve around diabetes and too much sugar, too little exercise, too many pounds are just that – myths. No matter what the diabetes type, none of us did this to ourselves. None of us asked for this disease. Quite a few of us, with diabetes and without, could benefit from losing weight, so why does society and the media vilify those with type 2 diabetes for needing to lose pounds? Yes, I used to love to eat pizza. Yes, I used to take a donut from the box in the break room at work. Yes, I ate fast food and processed foods. Yes, I used to eat bread. Yes, I bought into the travesty that was the Food Pyramid. Yes, I have type 2 diabetes. Other than the diagnosis, how am I much different than the majority of Americans? Laddie: I have learned enough about Type 2 diabetes not to blame the individual. I don’t think that there is a magic formula to becoming overweight and I certainly don’t think that being thin is a virtue, although popular media often tries to convince us otherwise. I do know that when I gain unwanted pounds, I feel sluggish, frustrated, and full of guilt for my perceived weakness. I blame society for much of the increase in average weight of our population. Many people, unfortunately including a lot of children, lead a much less active life than did their parents and grandparents at the same age. Too much TV and video game time has turned many of us into couch potatoes. Many children live in environments where it is not safe to walk to school or play outside unsupervised. Bad food is everywhere and often is less expensive than quality food. I believe that carbs are wonderfully delicious and highly addictive. More than once I have admitted to being incapable of eating carbs in moderation. No chocolate chip cookies is easier for me that just one chocolate chip cookie. No chocolate-covered donuts is easier for me than just one chocolate-covered donut. No potato chips is easier than just one. Also we are starting to see studies that indicate that the ubiquitous low fat heart-healthy diet is in fact responsible for making us heavier and less healthy. As Kate mentions, there are many people who are overweight but don’t have Type 2 diabetes. Weight is one trigger for Type 2 and we need more knowledge about the other triggers. We read statistics on the huge increase in the number of people with Type 2 and the increasingly younger ages at which it is showing up. But interestingly enough, the incidence of Type 1 is also increasing. There is a lot of bad stuff going on in our environment. Let’s dedicate ourselves to looking for answers rather than slinging blame on those who need our respect and support. Kate: Laddie and I are on the same page when it comes to unhealthy carbs being addictive. I am also someone who is better off having none rather than a “reasonable portion”. It’s difficult to deny yourself things that are soooo good, but it’s important that we remember to put our health first and fleeting pleasure second, at least the majority of the time. I believe that our society puts too much focus on weight and not enough focus on health. As someone who has thought about weight my entire adult life I feel that it would be easier to make healthy changes if we were told that our diet needed to change for health reasons and stop focusing on losing weight. Being told that you need to lose weight when it’s obviously something that doesn’t come easily is daunting, at best. Being told that certain foods are bad for your health might make it easier to give them up. I’m constantly reading on reputable websites (and the blasted media) that “if people with type 2 would lose a few pounds, their diabetes would be easier to control (or worse, go away!)”. I would rather hear that we need to stop eating unhealthy foods and be told to begin a healthier lifestyle. If we did that then the weight loss should naturally follow. So many “diabetes-friendly recipes” (I abhor that term) continue to focus on carbs rather than weaning us from things that cause our blood sugars to spike. There is also a movement in the medical community toward thinking that maybe the diabetes is to blame for the weight gain and not the other way around, in people with type 2. Dr. Peter Attia’s TedTalks video outlines that very topic quite well. In the end, everyone, regardless of diabetes dx, would benefit from a healthier lifestyle. Everyone would profit from less focus on weight. I’d love to see less finger-pointing and more camaraderie and understanding. A united diabetes front will do more good for all and possibly begin to swing the tide back to more understanding of our diseases. Laddie: Kate and I covered a lot of ground in our first Type 1/Type 2 Conversation. Weight is not always easy to talk about, but we managed to share our thoughts and hopefully learn a thing or two from each other. I believe that we shouldn’t shy away from difficult topics in the diabetes online community. At the same time we need to work to be respectful and supportive of each other. If I ever write anything insensitive, hurtful, or just plain wrong, I hope that Kate or someone else in the DOC will call me on it. Just be nice about it and I promise that I will learn from you. And I will apologize. And I will be a better person for it. Kate has chosen the topic for our second Type 1/Type 2 Conversation which will be published next Tuesday, July 15. Rumor is that it contains some fishing photos…. I hope you’ll join us. Starting next Tuesday, July 8, Kate Cornell of Sweet Success: My Life with Type 2 Diabetes and I will be publishing a series of collaborative blogposts titled Type 1/Type 2 Conversations. Each week we will select a topic related to diabetes and share our views in a back-and-forth discussion. Because I have Type 1 diabetes and Kate has Type 2 diabetes, we expect that we may agree on many things and at the same time run into a few areas where we have completely different experiences and viewpoints. The aim of these conversations is not to come to a consensus on a given topic or decide who is right and who is wrong. Our purpose is to communicate and talk about these issues. Both Kate and I believe that a strong diabetes community needs to reflect the voices of people with all types of diabetes and all experiences with diabetes: Type 1, Type 2, LADA, parents, and so on. We do not have to be the same in order to respect and support each other. In fact we are stronger because of our diversity. So let’s talk to each other and let’s learn from each other. The first topic that we are tackling is often a difficult one in the diabetes world. Please join us next Tuesday as we talk about Weight. Today I sent a letter to most of my friends and family members. It was easy for me to write a blogpost that was read by most of the DOC. It was harder to send an appeal to my “real life” friends and family. I know that the goal this year for the Spare a Rose, Save a Child campaign is $10,000 and we have almost reached it. I think that we can do better than that. Don’t be comfortable in your DOC niche. Be brave and send your appeal out to your co-workers, your neighbors, your family, and your friends. This is the letter that I emailed to most of my friends and family. Most of you know that I have had Type 1 Diabetes for 37 years. As the beneficiary of good insurance and financial security, I have consistently had access to expert medical care along with the latest and greatest technologies. Most importantly, I have never had to worry about the availability of insulin without which I would quickly die. I have lived a good life with and despite of diabetes and hope to continue to do so for many years. It is a rare occurrence for me to approach my friends and family about supporting programs that I am involved in. I embrace this cause wholeheartedly and encourage you to donate this week as we get ready to celebrate Valentine’s Day. To donate, go to: http://www.p4dc.com/spare-a-rose/give/ You will use PayPal to send your gift directly to the IDF. Please note the down arrow that gives you choices of how much to donate. Spare 1 Rose = $5 = 1 month of Life for a Child. 2 Roses = 2 Months and other options up to 2 dozen roses for 2 years of life for a child.